This is not a vampire book! That is what Richelle mead is know for, and what she does well, but many people are dissing this book because they can’t get their heads around reading something else. There is a similar issue with people reading The Casual Vacancy after reading Harry Potter, and they just don’t like it because the author’s writing style seems completely different and mentally there are always comparing it to Harry Potter or in this case, the Bloodlines and Vampire Academy series. Sometimes comparisons are okay, but everyone needs to keep in mind that the plot is different, even if the characters may have some similarities. Personally, I have only read Vampire Academy and Frostbite, so I didn’t have much to compare with but I can say that the writing style was different, but it was a good different. The storyline is so unique and I loved the idea behind intertwining Chinese folklore with other aspects of fantasy. The book is short but it tells the story well and there is good structure in the sense that the pacing is good and it does not seem rushed which is hard to accomplish in a limited amount of pages. 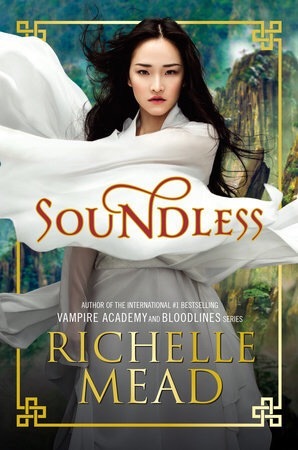 I could see Richelle Mead’s writing style peak through the main character as she reminds me of Rose Hathaway, in the sense that she is rebellious and headstrong but still follows the rules and is loyal. For those of you that worry about the romance being overly cheesy or instant… Do not fret because it was perfect. It was not a highlight of the book,but it was present. It was presented well, and intertwined well with the plot. This book was great! It did have a few downsides to it but I will get to that a little later. The writing was descriptive and powerful as you would expect with Richelle Mead’s writing. The world building was good for such a short novel, and I was able to really related to both characters within the world and the world itself. The idea of having a social heirachy is not uncommon to us in the 21st century, especially throughout Asia. Poverty and disease is also something that we are all aware of and can relate to in some form, therefore I think that the setting of this book was truly powerful. The characters – Fei, the main character is badass, talented, loyal and will stop at noting to protect her sister. She is the perfect character due to the fact that she is not perfect. She too believes that the world she lives in, is the only world she will ever know and that if being of a higher station that the man she loves means she can’t marry him, then that is the way she shall live her life. This however begins to gradually change and she questions her life once her sister starts going blind and gets kicked out of the apprentice programme, as she might have to become a beggar. As Fei and Li Wei climb down we begin to see the romance between the two but it isn’t cheesy or “in your face”. Li Wei brings out the best in Fei as he pushes to question everything, and shows her that she is more than just a talented artist. Romance – It was well executed. No insta-love, even though we knew that they had a history, they didn’t jump back into being with each other. It was a little cliché that in a time of “will I ever see you again” they had their whole romance thing, but it wasn’t to cringe worthy. I loved the idea of adding athenticity by talking about an arranged marriage and how in the culture, men and women would be separated as reltionships outside of marrital obligations would be seen as distractions. What I didn’t like – The part where Fei was climbing the mountain and she nearly gets to the top but then slips and falls back down onto the ledge where she started. Richelle Mead wrote one motivational sentence and Fei was off trying to climb the mountain again and succeeding in the span of 2 sentences. It seemed a little rushed and it made the journey back a little to easy and uneventful. Overall I thought the book was great and I would recommend it to both fans of Richelle Mead and any others that have an interest in YA fiction. This book has such a fascinating premise. I’m glad you feel like the narrative lived up to expectations. I don’t understand people getting frustrated with an author because they’ve done something different. Who wants to keep reading the same book over and over again? I love watching artists growing and changing. It’s one of my favourite things about stalking authors long term, haha! I completely agree! Everyone who is complaining that this book isn’t like Richelle Mead’s other work is simply stating the obvious. It’s still a great novel. Thank you for following Indifferent Ignorance. 🙂 I read the non-spolier part of the review and this looks really interesting, I’ll have to check it out.